A Two-Week Businees Triip with some Sunday Fun - - PAGE 441. A Two-Week Business Trip with some Sunday Fun · · PAGE 441. July 26, 2017: I returned to Florida late last week and have finally started to update this web site. I started by posting the photos related to my visit with my son and his family in York, PA last week. There is a new page in my family pages with the details. The rains and the hot summer weather motivate me to stay inside in the air conditioning. Going outside early or late in the day allows me to update the housing development photos in that section of the web site. July 13, 2018: I managed to visit a good friend in Easton, PA for lunch. He showed me a new commercial fiber optic node for the major cable companies. The thing was large and weighed in at about 60 pounds. He described all the modules inside and what each one did to get cable television signals out to the neighborhoods of America. We went to lunch and had the usual banter about times gone by and what is happening in the industry today. I took this photo of my rental car in front of his house as I headed back to my motel for the evening. As for flying interests, being away from home offered me a chance to visit a classic grass strip air field in Pennsylvania the secpmd weekend I was on the road. The details and photos begin below with the date of that visit to start it off. July 15, 2018: This Sunday on the road in the middle of a two-week road trip should have been a quiet day online at the motel. I went out to a nearby restaurant for a good breakfast and found no other patrons in the place at 9:30 AM. The manager seated me and as usual, I started a conversation about my trip. Somehow, also as usual, the subject of "pilot and airplane builder" was the trigger to get her to mention she wants to learn to fly. She then told me about an airport about 20 miles north of our location, not far from where she lives. When I finished my meal and the good conversation, I sat down in my car at 10:40 AM, switched my GPS to aviation mode, and located the airport. It was starting to rain and going back to the motel to get online for a while made sense. It gave me a chance to look at the weather radar and the local area forecast for the remainder of the day. The weather cleared and a beautiful day arrived after lunch time. I headed out from the motel at 1:55 PM and arrived at the airfield at 2:35 PM. The GPS ground track was 24.5 miles with an average speed of 34 MPH. In the last mile of country roads, I found this one-lane covered bridge crossing Tinicum Creek. The Van Sant Historic Airfield visit lasted from about 2:30 PM until around 7:45 PM based on the time stamps of the photos I am posting below. This other information sign is posted closer to the street from the signs seen above. This is the airport office and it was locked up tight with nobody home when I arrived. A classic glider sits outside the first hangar at the south end of the field. The southwest end of runway 25 is visible here along with the access road to the air field office and hangars. Up until I took this photo, I was all alone on the air field after the rain this morning had curtailed a typical Sunday for the locals at the airport. A few people showed up at 2:50 PM and we struck up a conversation about flying and our airplanes. The shade from the trees and the blue canopy provided good protection from the sun. The airport manager showed up around 3:30 PM and conversation changed as he offered to show me some of the classic airplanes in the hangars. A yellow Piper J3 Cub built in 1946 is well-maintained and used as a tail wheel trainer by the local flight instructors. The blue Bellanca Citabria is used for aerobatic training. This Piper Tri-Pacer was their first nose-wheel airplane built after the famous Piper Cub. Another Citabria is parked behind the Tri-Pacer. This Piper Cub has a name: "RAG DOLL 2" and sits waiting for the next pilot to go flying. A local commercial pilot and flight instructor stopped by to join the conversation. He and his wife live near the north end of the runway. She brought up two horses to treat a couple of kids to horse rides. Both horses are very gentle creatures accustomed to the attention of children. This is looking northeast at runway 7/25. The end of the runway is out of sight below the high ground half-way along the 3,050 feet of grass strip. From the same camera location of the two photos above, turning my camera a bit toward north reveals the GLIDER RUNWAY 5G and 23G which is only 1,340 feet in length. A number of other airplanes are tied down outside not far from the glider runway. This last runway 7/25 photograph is taken near the signs at the road entrance to the airport. One last look at the Van Sant Airport sign from the east side of the sign. I used forced flash to light up the signs in shadow from the late afternoon sun. 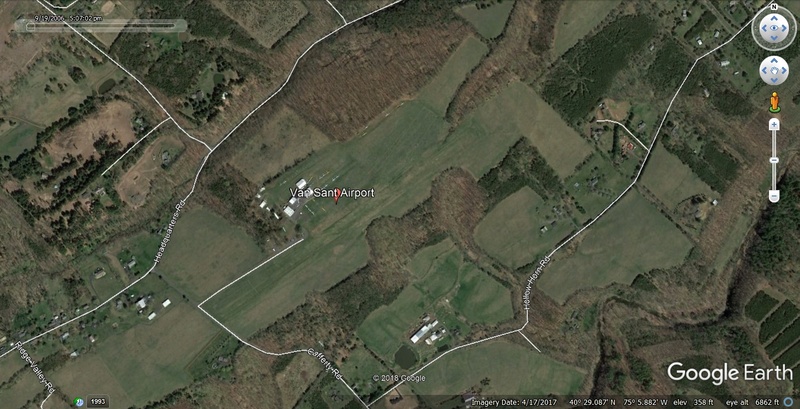 Here is a GOOGLE EARTH image looking down on the Van Sant Airport with NORTH UP. 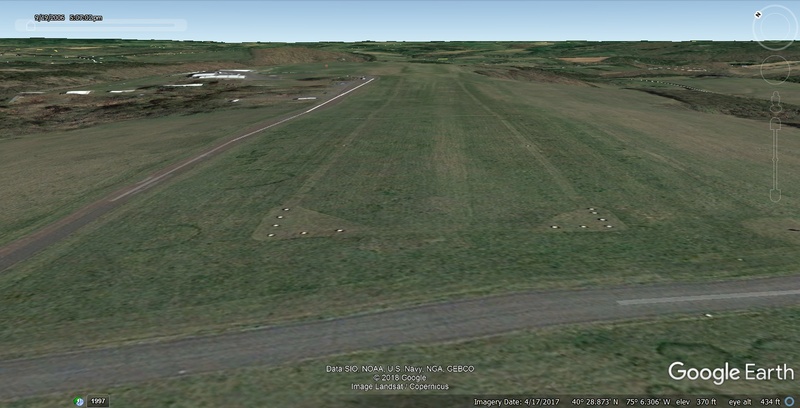 This second Google Earth image gives a pilot's view of the approach to runway 7 looking northeast from about 64 feet above ground level at this end of the runway. 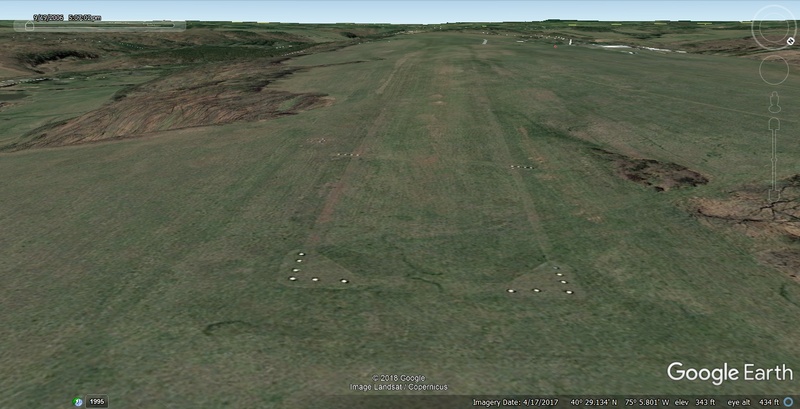 An approach to runway 25 looking southwest clearly shows the displaced threshold from about 100 feet above ground level. Since I did not walk up to the north end of the runway, I cannot be sure of the apparent "twist" in the surface of the runway. For now, I attribute this to an error in the ground elevation data in Google Earth. I have seen this in other airports like Mitchell, South Dakota and Yellowknife in the Yukon Territory of Canada.